CHAPEL HILL, NC – The Clemson women’s tennis team completed the first day of competition on Thursday at the 2006 Wilson/ITA Southeast Regional at the Cone-Kenfield Tennis Center on the campus of North Carolina in Chapel Hill, NC. Friday’s action will begin with the main singles draw at 8:00 am, while the round of 32 in the doubles bracket continues at 3:30 pm. Maria Brito and Alexandra Luc won their opening round doubles match over Valerie Behr and Lisa Suggs from UNC-Greensboro by an 8-1 decision. They will face Vanderbilt’s team of Catherine Newman and Amanda Taylor at 5:00 pm on Friday. Clemson’s team of Kathi Gerber and Ina Hadziselimovic fell to the Spartan duo of Arielle Vonstrolley and Erica Zabkar, 8-4. The Tigers’ ninth-seeded team of Selma Babic and Federica van Adrichem will face Hala Sufi and Claudia Szabo from Middle Tennessee University at 4:00 pm on Friday in the round of 32. Ani Mijacika and Carol Salge will also play their first doubles match of the tournament on Friday evening, taking another Blue Raider team, Pooja Kommireddi and Stephanie Parkison, at 6:00 pm. 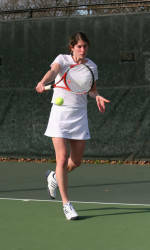 In qualifying singles action, Kathi Gerber suffered losses for Clemson. Hadziselimovic fell to Chelsea Albertz from the College of Charleston in a three-set match (1-6, 6-4, 7-6(5)), while Gerber was defeated by North Carolina’s Alex Jurewitz, 6-2, 6-3. Five Tiger players will begin singles competition in the main draw on Friday, as Babic, Brito, Luc, Mijacika and Salge have opening-round matches.